46 74550-2689 - 7/16 Round/axle Bushing (black). 52 78490-4029 - Battery Retainer. 18 73233-2279 - Taillight Lens Set. 53 0801-0220 - 10 X 1inch Screw. 47 0801-0605 - Bolt 5/16 In. X 3 1/2. 65 0801-0257 - Hinge Pin. 30 74526-2179 - Knob Plate. 21 74450-2279 - Headlight Lens (blue). 22 74526-2339 - Headlight Gaurd. 19 73233-2759 - Taillight Housing Set. 42 74450-9219 - Sport Bar. 7 78490-9829 - Footboard Assembly. 41 74270-2039 - Rear Bumper. 20 78490-2179 - Sport Bar Bracket Set. 35 74526-9619 - Windshield Assem. 57 0801-0604 - .354 Black Retainer/cap Nut. 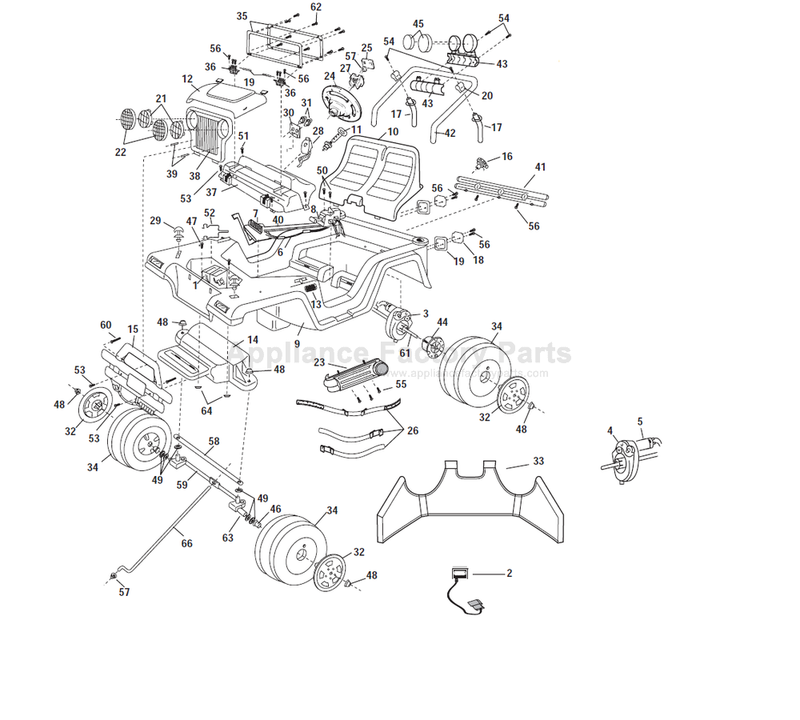 25 74526-2759 - Steering Wheel Plate. 24 74526-9739 - Steering Wheel.